With the UK surrounded by water swimming should be a survival skill of all its residents, but a recent survey shows this is far from reality, and learning to swim is more important a safety issue than ever. Swimming is a great way for children have fun and stay healthy, but for parents at least, its main attraction is safety. According to the Royal Society for the Prevention of Accidents (RoSPA) drowning is the third most common cause of accidental death to children in the UK. Living in a country surrounded by water with pools, ponds, rivers and lakes everywhere, drowning is an every day risk and its threat can be minimised by learning to swim. Unfortunately a recent survey has shown that more than one third of British 11-year olds have not mastered basic swimming skills, and the situation is worsening every year. With one in five children leaving primary school without being able to swim, it is increasingly becoming a parent’s responsibility to make sure they get a proper swimming education. 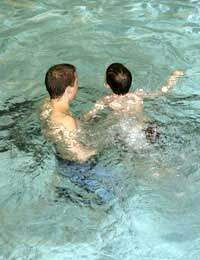 Even so, those that do receive swim tuition, as part of the curriculum’s compulsory Key Stages one and two, only spend around hour a week in the water and if a child is to become a strong and safe swimmer ideally they should supplement their school practice with regular visits to a local pool. A child will learn much faster if visit to the pool are little and often rather than long and infrequent. Learning to swim should not be a chore, but a fun social gathering. Families and friends should visit the swimming baths together. Children who want to receive a full and rounded swimming education and not rely on their parents’ novice tuition can sign up for a swimming course at their local pool. The Swimming Teachers Association (STA) has developed one such swim programme, the International Swimming and Water Safety Standards (ISWSS) initiative, an award scheme that recognises children learn to swim at varying ages and paces. Through a series of Awards categories a child can progress from a ‘STARFISH’ to a ‘Shark’ as their swimming skills improve. Upon completion of each award, the child is presented with a bright and colourful STA badge to be sewn onto their swimwear, as well as a grand STA certificate. Water safety plays a key role in the learning experience, whatever level the child begins climbing the ladder. It’s never too early for a child to begin their path towards becoming a strong and safe swimmer – in fact often the younger the child is the easier they will find it to pick it up. STA’s ISWSS STARFISH Award introduces pre-school children from as young as six months to the water and teaches them to be confident in the pool. Start young. Introduce a child to water with a paddling pool. Consider joining a special parent and baby swimming programme. Introduce toddlers into the water by holding them close. They will feel more at ease if they know they are being protected. Always ask if the learn to swim programme includes water safety education. Make sure a lifeguard is on duty during the classes. Make sure the swim school is a member of the National Federation of Swim Schools. There are many adult non-swimmers who are missing out on the pleasures and health benefits of swimming, and mistakenly believe they are too old to learn. This is not the case, and there are many adult swimming classes available at pools around the UK specialising in providing sympathetic and friendly learn to swim programmes.